Many people look at the nutritional value of the food they choose to eat, as it's part of making healthier choices. This is the reason why food packaging lists all of the ingredients and how much nutrients they contain. Of course, in order for that information to be useful, it must be accurate. While the majority of food manufacturers are perfectly honest, there was a recent discovery involving rice from China that will leave many consumers terrified. Some may guess that it involves a Chinese firm deciding to lower the number of calories their rice contains or exaggerating the amount of vitamins or other nutrients it contains, but the reality is a lot more scary. It goes beyond falsified labels or even adding undisclosed chemicals to make it look better. The rice itself is fake. Even though fake foods are sometimes legitimately produced to serve as display dishes for some eating establishments or as props for artistic productions and there have been a few cases where a shipment of imitation food was mistaken for the real thing, this isn't the case here. 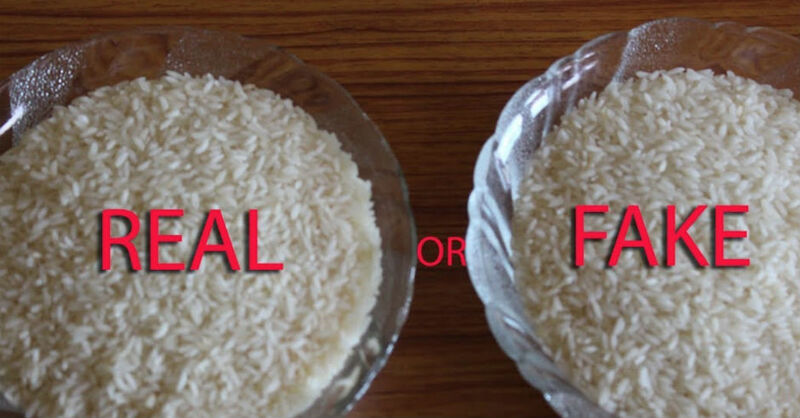 The fake rice is deliberately made to fool consumers who will be eating it. Research done on Chinese rice factories shows that some have been making a form of synthetic rice that is sold as the more expensive Wuchang variety, purely to boost their profits. The fake rice is made by mixing various kinds of potatoes with synthetic resin (plastic). Machines then form grain shapes with the mixture and the process is completed by spraying the new “rice” with fragrances that give it the same smell one might expect from real Wuchang rice. Everyone should know that eating plastic can cause some serious health problems, as it contains a variety of toxic chemicals that just aren't meant to be consumed by humans. For now, there have been no reports of counterfeit rice being imported into the US, it is sold in China and has been seen in a few other countries too. If you want to be sure that you're getting real rice, you can do a few simple tests on it to confirm that it isn't the synthetic version. The simplest test involves stirring just a tablespoon of rice into a glass of water. Real rice is dense and will end up sinking, while plastic has a tendency to float. You can also try boiling your rice and watching the pot closely. Once the water comes to a boil, fake rice will form a thick residue layer at the surface. Another quick way to verify if your rice is authentic is to burn it. Pour out some rice on a fireproof surface and bring a match to it. The fake rice will emit a plastic smell. In some cases, you might also notice that it smells like sweet potatoes as it burns. Finally, a slower experiment is possible if you don't intend to eat the rice right away. Just cook a small amount of it and place it into an unsealed container on your counter. This method is the most reliable to identify fake rice, as letting actual rice sit for a few days in this manner will cause mold to form. If you can't see any trace of it at all, that's a definite sign that you're not dealing with real rice. Chinese officials are aware of this fake rice and are taking measures to stop it from being produced or exported. Even though it's very unlikely you'll see it, it's always good to be aware of the counterfeit product and how to spot it.